Welcome to The Fariña Files web site. This is a non-profit repository of reference materials and ephemera on the lives and careers of Richard and Mimi Fariña, the folk revival, and the Cambridge, Massachusetts folk scene of the 1960s; who they were, what they did and occasionally where they went. The site is ongoing. But who isn't? Special mention to Duncan Emrich. 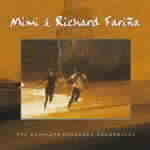 And while in the neighborhood, please look in on Doug Cooke's Mimi & Richard Fariña Website.